What happens in the convective zone of the Sun? 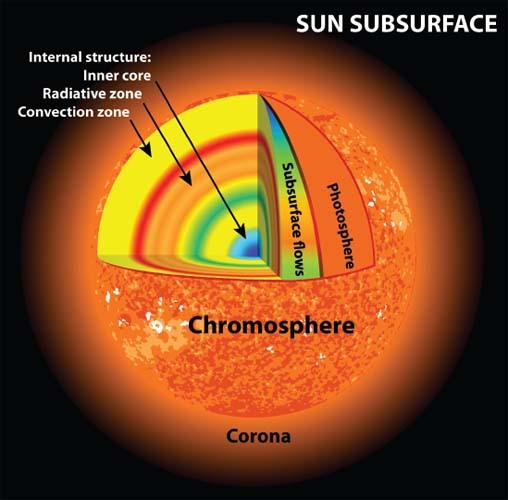 The convective zone begins at a depth of about 90,000 miles (150,000 kilometers) below the surface of the Sun. In the convective zone, the temperatures are cool enough—under 1,800,000 degrees Fahrenheit (1,000,000 degrees Kelvin)—that the atoms in the plasma there can absorb the photons coming outward from the Sun’s radiative zone. The plasma gets very hot, and begins to rise upward out of the Sun. The motion of the plasma creates convection currents, like those that happen in Earth’s atmosphere and oceans, which carry the Sun’s energy to the photosphere on seething rivers of hot gases. This is how the convection works. As the temperature of the gas that has absorbed energy at the bottom of the convection zone increases, the gas expands, becoming less dense than its surroundings. These bundles of hot gas, because they are less dense, float up toward the surface of the convection layer like hot air balloons rising up into the air on a cold morning. At the top of this layer, they radiate away their excess energy, becoming cooler and denser, and then they sink down again through the convection layer. The effect is a continuous cycle of “conveyor belts” of hot gas moving up and cooler gas moving down. The layers of the Sun.